After a closer-than-expected win over Utah State in the season opener, Michigan State coach Mark Dantonio pointed out that this was nothing new for the Spartans. Then last weekend, Michigan State found itself in another close game — and came up short. 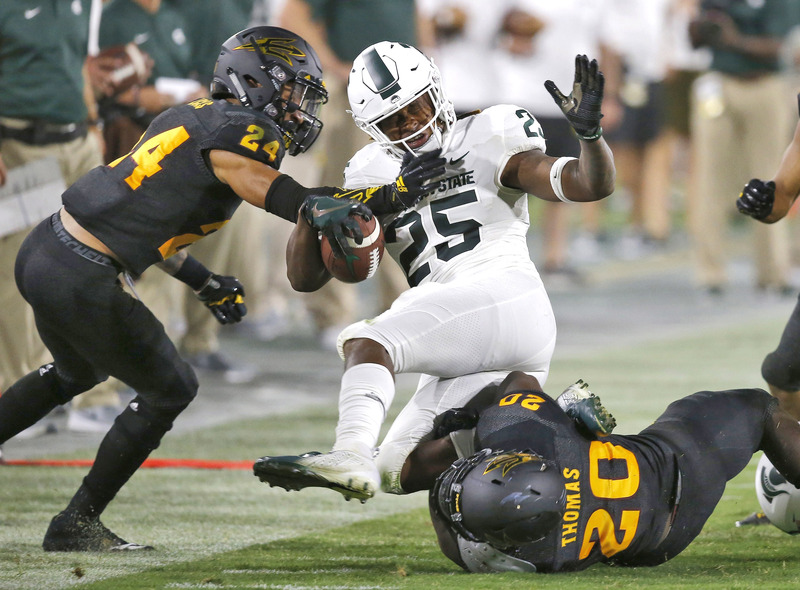 Arizona State beat the Spartans on Saturday night on a last-second field goal, leaving Michigan State at 1-1 heading into its open date. The Spartans came into the season with high expectations and a wealth of returning starters, but they’ve looked eminently beatable so far. After winning 10 games last season, the Spartans certainly looked like they’d have a shot at the Big Ten title in 2018, but they haven’t hit their stride so far. Michigan State beat Utah State 38-31 and led Arizona State 13-3 at the start of the fourth quarter. If the visiting Spartans had held on Saturday, Dantonio’s comment about pulling out close games would have seemed prescient, but the Sun Devils tied it in the fourth, then were able to run down the clock and win 16-13 on Brandon Ruiz’s 28-yard kick. Michigan State has moved the ball fine, but the 25th-ranked Spartans certainly haven’t maximized their opportunities. Against Utah State, they settled for field goals on two opportunities near the goal line. Against Arizona State, they turned two red zone trips into field goals and wasted another one entirely when Brian Lewerke threw an interception. Michigan State has achieved a lot of success over the past decade by being able to win tight, defensive struggles, but the Spartans weren’t able to do that last weekend. With 4:55 remaining and the game tied, Arizona State took over on its own 21, and Michigan State’s defense couldn’t get off the field. Manny Wilkins threw a 25-yard pass to Eno Benjamin on third-and-8. Then Justin Layne was called for pass interference on third down, and the Sun Devils were in business at the Michigan State 29. The winning field goal came on the game’s final play. The Spartans had let another game stay close, and this time they paid for it. After this break in their schedule, the Spartans open Big Ten play on the road against Indiana on Sept. 22. NOTES: Dantonio said P Jake Hartbarger is out six to eight weeks with an injury.